Eventide Fenway — Eventide Oyster Co.
A counter-style reimagining of Eventide Oyster Co., Eventide Fenway offers the tried and true classics made popular at the Portland restaurant. 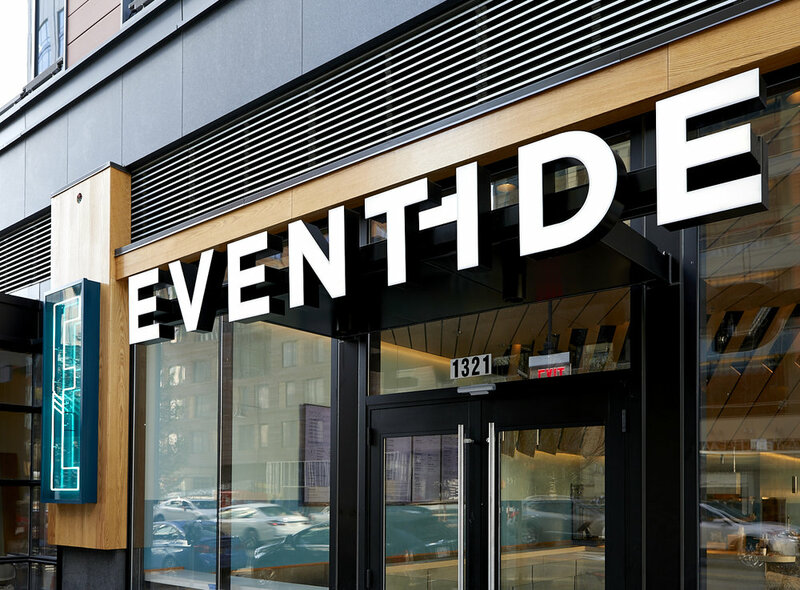 Eventide Fenway is more tightly focused, intent on meeting Boston's demands for freshly shucked oysters and craveable brown butter lobster rolls. Whether you're grabbing lunch on the go, or aim to crush a few dozen oysters and a carafe of rosé—you'll find us ready, just steps from the ballpark. Because of the counter-service style of our restaurant, we are unable to accommodate reservations. Our selection changes frequently—ask your server. Available on location only. Ask your server. Take over one of our communal tables and enjoy a quintessential New England experience. Available for parties of 6 or more, our Lobster Bake features a family style offering of lobsters, clams, mussels, salt pork, knackwurst, potatoes, hard boiled eggs, steamed buns, and all of the fixings. NOTE: Requires 72 hours advance booking.